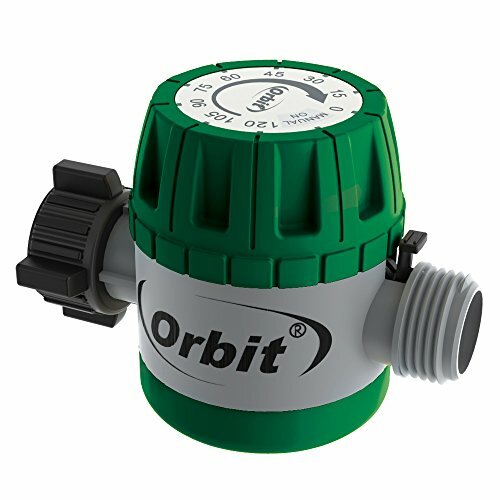 The Orbit Mechanical Watering Timer provides timed watering from 15 to 120 minutes, giving your lawn just the right amount of water. It works just like an egg timer: twist the dial to the desired watering duration, and the timer will turn itself off upon completion. The mechanical operation requires no batteries and makes for an easy and quick solution for your watering needs. If you don't have a specific timespan in mind, simply use the manual override to keep the water flowing as long as needed. This timer features a comfort grip large dial for ease of use and is constructed of durable high-impact plastic. It comes with an ergonomic swivel for easy hose attachment. Using this timer also saves water in drought conditions.